Hot rollers can be a great hair tool for adding luxurious curls or flowing waves. However the extreme heat provided by this styling tool can lead to damaged hair strands, breakage, and dryness if you choose the wrong set of hot rollers. There are many different varieties of hot rollers on the market today, which make it relatively easy to choose the ones that will give the best results without excessively damaging your hair. In order to narrow down the possibilities when shopping you should focus on the look you want and your specific hair type. Individuals with normal, healthy hair can pretty much choose any style of hot rollers and still achieve great results. However, if your hair is extremely dry or damaged, or if you plan to use the hot rollers daily, you will want rollers that offer extra protection. Rollers with Teflon coatings will resist hair product build up and eliminate the snagging or grabbing when rolling or unrolling that can cause hair strand breakage and split-ends. And, rollers that are wrapped in velvet will allow damaged hair to slide over the roller resulting in less damage. Since damaged hair is usually lacking in moisture, another great option is to choose a set of hot rollers that is heated with steam. The extra hydration from the steam-heated hot rollers will help eliminate excess drying, static electricity, and frizz, while softening hair and adding shine and volume. Another good option to look for in hot rollers is a ceramic coating. Ceramic-coated metal rollers use less heat to curl the hair, provide a more evenly heated rolling surface, help protect the natural moisture levels in the hair, and reduce frizz. Combined these benefits help reduce split-ends, hair strand breakage, brittleness, and premature hair loss. Finally, bendable rollers that are constructed of soft plastic or rubber materials are a great option for gently curling damaged hair. These hot rollers offer a smooth surface for gentle rolling, a mild heat for moisture protection, and greater rolling versatility, which allows you to get the exact look you want without tightly pulling the hair strands or putting excess pressure on the hair root. Once you have chosen the perfect set of hot rollers you need to know how to prep your hair to get the safest style and the longest lasting curls. Since all hot rollers use heat to set the curl you will want to protect your hair from heat damage as best you can. When using hot rollers frequently make sure that you deep condition your hair, with a hydrating conditioner or hot oil treatment, at least once a week. And, since you are already applying heat with the rollers, try to avoid excessive use of other heated tools such as blow dryers and curling irons. 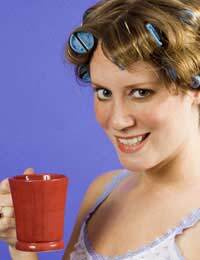 Finally, by keeping your hair in good condition, you can reduce the amount of damage hot rollers can cause. Make sure that you get your hair trimmed at least every six weeks to avoid split-ends. Never brush wet hair, which can cause strand damage and breakage. And be sure to give your hair a break from heat and over styling at least once a week to rest hair strands and lock in natural moisture. If used correctly hot rollers can actually be a safer way to add curl than curling irons and chemical perms. By following a few safety tips you can enjoy perky curls without the hair damage. Never roll wet hair. Rolling wet or damp hair can cause frizz, brittleness, and steam burning of the hair strands. Always use a protective styling product before rolling. By coating the hair with gel, spray, or mousse you will add a layer of heat protection while providing the strands with the lubrication necessary to smoothly wrap around the heated roller. Always protect the ends of your hair. By wrapping a small piece of moistened tissue paper around the bottom inch of your hair you can help prevent split-ends and strand breakage caused by heat.